Save Those 1st Selectman Proclamations. They’ll Be Worth Something Someday. This was not on an official document, signed when he was 1st Selectman (or, before that, RTM moderator). It had nothing to do with WestportNow, his popular town news site, which is online (so there’s of course nothing to sign). 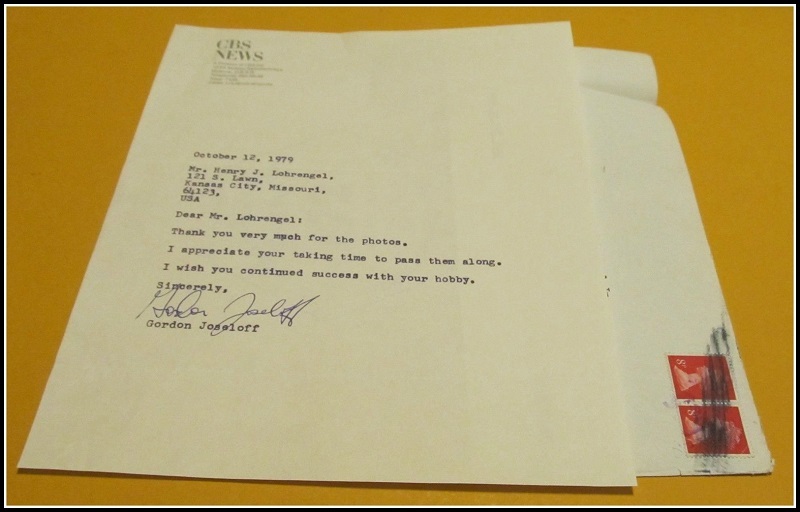 No — Joseloff’s auctioned signature was on a 1979 letter he sent, on official CBS News letterhead, while serving as Moscow bureau chief. Mr. Henry J. Lohrengel of Kansas City apparently mailed Joseloff some photos; this letter was a polite thank-you in reply. There’s no word on why the letter was saved, or how it ended up in Worcester, Massachusetts, with the current owner. Or, for that matter, why he (or she) decided to put it up for bid now. On the other hand, a postcard signed by H. V. Kaltenborn — a very famous radio commentator (like the Chicago Tribune, he called Dewey the presidential winner in 1948 over Truman) — is currently being auctioned on eBay. It’s drawn just 1 bid. This entry was posted in Local politics, People, Totally random and tagged eBay, Gordon Joseloff, H. V. Kaltenborn. Bookmark the permalink. Hmm. Wonder what that Miss Universe announcement card would fetch? Ah, so about 8 pence, give or take? Preparation photos for the Moscow 1980 Olympics?! Mixed up with Michael, the Emmy winner, then?